There are many different people, backgrounds and lifestyles that make up the diving community. Open circuit divers vs rebreather divers, year-round divers vs warm-water divers, tech gear vs travel gear, snorkel vs air-mcdoodle…. All of these differences are a topic for conversation between us. The why’s and the how’s and the where’s are all points of perspective that show our history of how we got to where we are in this great underwater adventure. The dive boat is a meeting place for different stories and lineages of what we do. It is where we all come together with our past and spend time doing what we love. Diving! The World Would Be A Better Place With More Scuba Divers article that we chose for last week’s episode shares the influence and emotional connections that we all have in ourselves to make up this wonderful community. A group of divers, regardless of level and equipment configuration, will all surface from the same dive and celebrate life in a way a non-diver will not know. As scuba divers we have a bond that we share with others like us. The stories we tell our friends and families or anyone who will listen illustrate the influence the underwater world has had on us and what we mean when we say we are enjoying life. Going beyond your limitations as a diver might seem like an exciting adventure and having someone to take you to a place that you are not yet trained or certified to see will certainly add to that eagerness. Having someone take you on your first night dive before you’ve done your advanced class or showing you how to hook up a lift bag to an object and bring it up as a treasure is almost a rite of passage for many new divers. It seems so honest and innocent but as we heard in this week’s episode… this can quickly turn in the opposite direction and with dire consequences. There is a significant difference between mentoring an aspiring diver, building experience with them, learning each other’s habits and attitude in the water and helping to guide them into a new area that they are unsure of. As opposed to taking a diver that you do not know or have no genuine experience with and especially when neither of you are prepared to properly be in that unfamiliar environment. The trust me dive is just that. It is where a seemingly experienced and advanced diver takes a newer and assumingly less experienced diver into more depth or a more demanding location beyond the knowledge and training of the new diver. The trust me dive takes the new diver to a place where they are unprepared in one way or another… or multiple ways and others. In hindsight, this is very dangerous. It can put the new diver into a situation they are not prepared to handle. Even if they have the mental toughness to endure the situation, they may simply be unable to reason the decision-making that needs to take place. Additionally, this assumes they have been informed of the hazards as well as possess and understand the use of the area specific equipment needed on that dive. The worst part of the trust me dive is that if it is completed successfully without incident it creates a shift in the diver’s mind of acceptable behavior. This new level of acceptance can push the standard of qualification to a place where the right gear, right training and right mindset are no longer even considered. During Episode 40 we made a few comments about a diver getting ready to do an ice dive who was wearing a pony bottle and carrying a spare air. These additional redundant air sources are classically added to the divers’ normal gear, to prepare for an emergency. But does adding this extra gas create a real solution for an emergency or does it add new confusion and complexity to the emergency? Brando and I made a comment about why it is smarter to plan your gas from the backside instead of just adding extras. Make a normal ascent if possible. Use your buddies alternate air source if a normal breathing ascent of your own could not be made. If you couldn’t find your buddy you should make a controlled emergency swimming ascent at a safe rate while continuing to exhale. Although difficult and out of social favor today, there was always the possibility to share one regulator and buddy breathe to the surface. And lastly if all else failed you could still make a buoyant emergency swimming ascent and shoot uncontrolled to the surface. As the recreational diver advances in traditional courses, they are instructed to take with them a redundant air supply. But were does this fit into the original choices. Does it become the new last choice? The new first? Do we put it in the middle somewhere?? -Normal ascent on our own if possible. -Can’t find it so then look for buddy? -What if it is out of gas too? Then look for buddy? -What if it is breathing wet and I panic? Do I then look for my buddie’s alternate air source? -Why would I go to a pony if the original protocol was to go to my buddy? -So, should I go to buddy and use alternate air source before the pony? -So then why carry the pony? -Because my buddy might not be there? -Because my buddy might not have enough for us to use? -If my buddy wasn’t around is the problem a gas redundancy issue or a team awareness issue? -If my buddy isn’t around so then I go to my pony and I can’t find it, what happens? -If my buddy isn’t around so I decide to go to my pony and it is out of gas too, what do I do? - Make a Controlled Emergency Swimming Ascent? -If my buddy isn’t around and I go to my pony and it is breathing wet and I panic do I skip right to the buoyant emergency swimming ascent? Planning your gas from the backside means that you need to know on all dives how much gas is needed to get you and your buddy home… Assuming they lose everything. As well as having a team mate in the water that plans the same way and is always thinking the same way. This reserve is on a system that can be reliably donated 100% of the time, is completely manageable by the diver wearing it, allows two divers to continuously breathe back to safety, slowly and safely with safe ascent rates and stops, and is a different amount depending on depth or distance home. Good scuba education teaches this concept as the core of gas management tools. Think back to some of the dives that you have done in the past. Frustrating dives where you didn’t know where your buddy was at, where you gave up on caring, assumed they’d be fine and you would see them back on the boat. Remember back to when you were learning how to drive a car. One of the first things you learned to do when you sat behind the wheel of a vehicle was to adjust the mirrors. The rear view and side mirrors, when properly adjusted, allowed you to stay seated and driving the vehicle and still see all around you. Other cars approached from the back as well as both sides but you could focus on driving the car out of your peripheral. Occasionally you need to check your blind spots but overall you can maintain your progress without interruption. 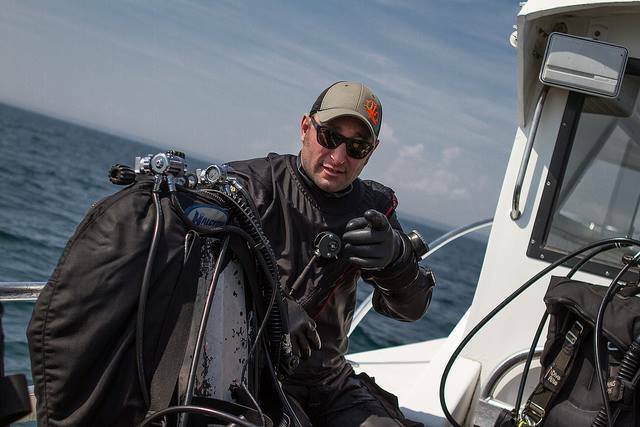 Passive communication is a critical tool for a dive team to practice and develop. From the basic beginner through to the advanced explorer, these communication skills will enhance the performance of any dive team. Always knowing, without question, where your team mates are. This is the core of performance buddy diving. At the end of Episode 27, I made a comment about needing perfect buoyancy. Brando spoke of the artist breaking the rules of photography to create the magic in an image. At the same time, I was making a point about the diver doing the same thing and becoming an artist themselves. An artist underwater. A diver really awakening and making diving an art. Someone more than a person with a C-Card. I said that in the beginning you need to work hard on getting perfect buoyancy. The new diver needs to have a solid foundation in this base because it is the core of everything you will do underwater. The new diver needs to find an instructor that can help them build and develop this ability. Precision buoyancy, controlled trim, effortless balance, and a mastery of propulsion that gives them an ability to move carefree and aware and for deliberate purpose. It is after you have mastered these that you can learn to break trim on purpose. So you can move from horizontal to vertical and back to horizontal in a calculated manner that doesn’t disrupt any of the environment. Where you can film and follow an Eagle Ray passing over you, enter a hatch on a shipwreck, swim through a hollow in the coral reef or navigate a restriction in a cave. These are done without hands flailing or floundering and always return you back to your neutral, balanced and controlled base. This ability should not be a specialty. It should not be advanced training for the elite. This should be the beginning.